US-based Milliken will put its focus on NX UltraClear polypropylene (PP) for food and beverage industry at Alimentaria 2016, which takes place in Barcelona, Spain from April 25-28. With UltraClear PP based on Milliken’s clarifier series Millad NX 8000, the same high clarity associated with polyethylene terephthalate (PET) packaging can be achieved, according to the company. The material is suitable for production of microwaveable and recyclable PP thermoforming and foldable packaging. Applications based on NX UltraClear PP are considerably lighter in weight. 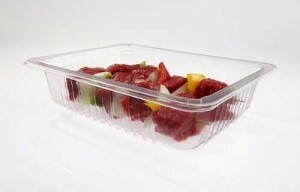 For example, UltraClear PP trays offer a 17.8% weight saving compared to PET-based food trays. The material is also available for extrusion blow molded (EBM) transparent bottles. As said, Millad NX 8000 clarified PP offers the lowest density and lower weight compared to all alternative plastics materials and glass, and provides a one-material solution cost-efficiency. For example, for clear handleware bottles, PP based on Millad NX 8000E has a density of 0.9g/cc compared to PET with 1.35g/cc, and the same clarity level. As for injection molded thin-wall packaging, Milliken said the Millad NX 8000 additive creates a more sustainable packaging solution by allowing temperatures during the injection molding process to be lowered by 45°C. Milliken will also introduce its ClearTint CUV transparent UV absorber specifically designed for use in PP. This additive can be used to inhibit UV light transmission in injection molding, thermoforming and blow molding. It protects the contents of packaging from UV light while maintaining the glass clarity look of Millad NX 8000 clarified PP. Another product for UV protection is ClearSheild UV absorbers for PET bottles. The additive maintains the transparency of PET while blocking UV rays up to 390mn, according to the company.